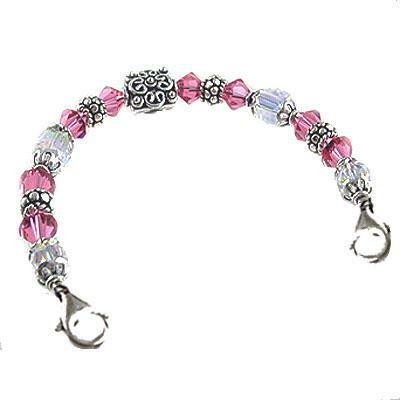 Creative Medical ID Alert Bracelets and stylish jewelry custom engraved for men, women, children - Feminine crystal medical interchangeable bracelet strand. Alluring & feminine...Think of classic beauty, in a true lady-like style. 6mm Swarovski light reflective Crystal AB Cubes and Rounds, Bali beadcaps & spacers mix with your choice of 6mm bicone crystal color (see chart below) An intricate 10mm Romantic Antique-styled Bali silver focal bead is the centerpiece of this spectacular design!